aFrom the Neuroradiology Research Laboratory (A.R., Y.-H.D., D.D., Y.Q.Z., D.F.K., R.K.), Mayo Clinic College of Medicine, Rochester, Minnesotabthe Department of Radiology (A.R., W.B., H.J.C., D.F.K. ), Mayo Clinic, Rochester, Minnesota. bthe Department of Radiology (A.R., W.B., H.J.C., D.F.K. ), Mayo Clinic, Rochester, Minnesota. BACKGROUND AND PURPOSE: The WEB Occlusion Score has been proposed to assess angiographic outcomes for intracranial aneurysms treated with the Woven EndoBridge (WEB) device. Using a large series of experimental aneurysms treated with the WEB, we had the following objectives: 1) to compare angiographic outcomes as measured by the WEB Occlusion Scale with histologic results, and 2) to assess interobserver and intraobserver agreement of the WEB Occlusion Scale. MATERIALS AND METHODS: Intracranial aneurysms were created in 80 rabbits and treated with WEB devices. Animals were sacrificed at last follow-up for histologic evaluation. DSA was performed just after the deployment of the device and at follow-up. Four investigators independently and retrospectively graded the DSA twice according to the WEB Occlusion Scale. One histopathologist blinded to the angiographic results graded the occlusion according to a 4-point scale patterned on the WEB Occlusion Scale. Intra- and interobserver agreement were evaluated for DSA. Follow-up angiographic grading and histologic reference were compared to determine the WEB Occlusion Scale accuracy for complete (with or without recess filling) versus incomplete occlusion and adequate (complete occlusion or neck remnant) versus inadequate occlusion. RESULTS: Inter- and intraobserver weighted κ for the angiographic WEB Occlusion Scale were, respectively, 0.76 and 0.76, indicating substantial agreement. The sensitivity and specificity of the WEB Occlusion Scale for complete occlusion at follow-up compared with the histologic reference standard were, respectively, 75% and 83.3%, with an overall accuracy of 80%. Similarly, for adequate occlusion at follow-up, sensitivity was 97.7%, specificity was 64.9%, and overall accuracy was 82.5%. CONCLUSIONS: The WEB Occlusion Scale appears to be consistent, reliable, and accurate compared with a histologic reference standard. Because the mechanism of action of the device differs from that in flow diverters and endosaccular coils, developing tools to assess angiographic occlusion has become a recent priority among many neurointerventionists, and several grading scales have been proposed.4,7⇓⇓–10 Perhaps the most commonly used scale is the WEB Occlusion Scale (WOS).7 However, none of these scales, including the WOS, has previously been validated with histologic studies, to our knowledge. In a large series of elastase-induced aneurysms in rabbits treated with the WEB device, the objectives of this study were the following: 1) to compare angiographic outcomes as measured by the WOS with histologic results, and 2) to assess interobserver and intraobserver agreement of the WOS. The Institutional Animal Care and Use Committee at our Institution approved the animal procedures. Elastase-induced aneurysms were created in 80 New Zealand white rabbits. Aneurysm creation procedures were performed as previously described by our study group.11 Aneurysms were treated at least 3 weeks after aneurysm creation.12 No antiplatelet therapy was used before or after treatment. During the device-deployment procedure, animals were anesthetized, the right femoral artery was exposed, and a 5F sheath was inserted, followed by injection of 500 U of heparin through the sheath. A 5F guide catheter (Envoy; Codman & Shurtleff, Raynham, Massachusetts) was advanced into the aortic arch. Digital subtraction angiography was performed with contrast injection through the guide catheter. 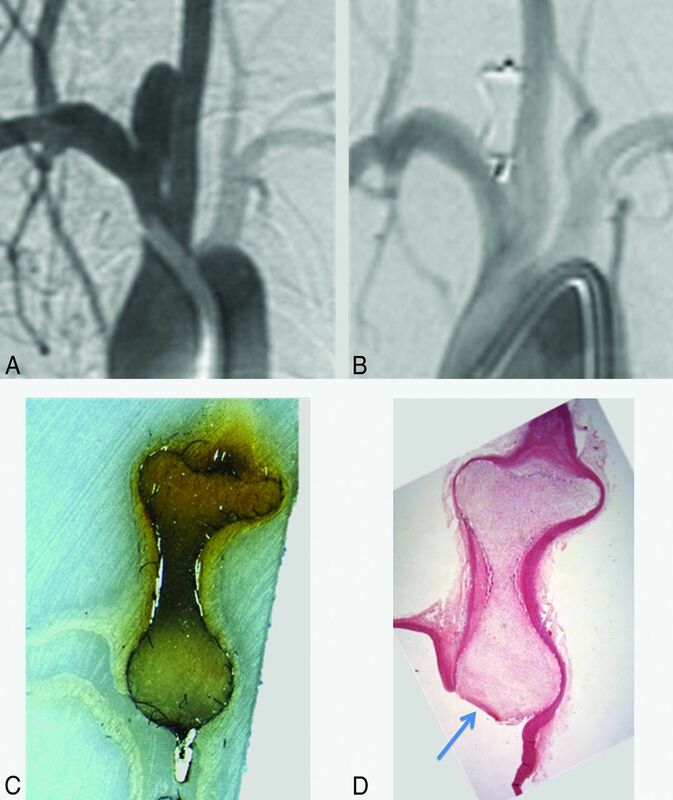 A microcatheter (Renegade Hi-Flo; Boston Scientific, Natick, Massachusetts) was advanced into the aneurysm lumen over a microguidewire (Transend EX; Stryker, Kalamazoo, Michigan) through the guide catheter. The WEB size was selected according to the aneurysm size. After deployment of the device, the microcatheter was removed and DSA was performed through the guide catheter at the brachiocephalic trunk immediately and 5 minutes following device implantation. Follow-up angiographic evaluation was performed at the sacrifice end point according to the WEB Occlusion Scale as described by Fiorella et al.7 Animals were sacrificed with a lethal injection of pentobarbital. Aneurysm and parent artery tissue were immediately fixed in 10% neutral buffered formalin. Four investigators independently and retrospectively examined selected images of the posttreatment and follow-up DSA to grade the occlusion status according to the WEB Occlusion Scale. These readings were performed twice by each of the investigators at 2-month intervals to analyze the intraobserver correlation in the readings. The WEB Occlusion Scale is a 4-point scale using the following grades: complete aneurysm occlusion, complete occlusion with recess filling, aneurysm neck remnants, and aneurysm remnants. The investigators also evaluated the modification of the aneurysm occlusion status between posttreatment and follow-up DSA as follows: improvement, stable, or recurrence. To compare follow-up DSA readings and histologic findings, we dichotomized DSA results as complete occlusion (with or without proximal recess filling) or incomplete occlusion (neck remnant or aneurysm remnant); similarly, we dichotomized DSA results as adequate occlusion (complete occlusion or neck remnant) or inadequate occlusion (aneurysm remnant), according to previous studies.8,13 In case of disagreement among readers, a fifth reader adjudicated between adequate or inadequate occlusion. The histologic results for each aneurysm were evaluated according to a 4-point histologic scale, patterned on the angiographic WEB Occlusion Scale with the same items: complete aneurysm occlusion, complete occlusion with recess filling, aneurysm neck remnants, and aneurysm remnants. Statistical analysis was performed by using the statistical software package SAS 9.0 (SAS Institute, Cary, North Carolina). Interobserver and intraobserver agreement was assessed by using the quadratic weighted κ statistic. κ statistics for interobserver agreement were calculated between each observer. Mean κ values were calculated as well. The ANOVA intraclass correlation between readers was calculated. The sensitivity, specificity, and accuracy of DSA evaluations at last angiographic follow-up were calculated by using the histologic findings as a reference standard. These were calculated on a per-reading basis. Eighty consecutively treated rabbits were included in this study. The length of follow-up varied from 30 to 365 days, with a mean length of follow-up of 101.4 days. Rabbits were sacrificed at day 30 (n = 27), day 50 (n = 5), day 90 (n = 30), day 180 (n = 12), or day 365 (n = 6). A Single-Layer WEB was used in 55% of cases (n = 44), and a Dual-Layer WEB was used in 45% of cases (n = 36). Eight readings were performed for each of the 80 posttreatment and 80 follow-up DSAs (4 readers doing the same reading twice at 2-month intervals). Immediate posttreatment DSA showed 8.3% complete occlusion (n = 53/640 readings), 3.8% (n = 24) complete occlusion with recess filling, 12.7% (n = 81) neck remnants, and 75.3% (n = 482) aneurysm remnants. At last follow-up DSA, we observed 24.6% complete occlusion (n = 157/639 readings), 21.6% (n = 138) complete occlusion with recess filling, 30.8% (n = 197) neck remnants, and 23.0% (n = 147) aneurysm remnants. The interobserver weighted κ coefficient for agreement of the occlusion grade according to the angiographic WEB occlusion scale was 0.76 (95% CI, 0.76–0.82), indicating substantial agreement among readers (range, 0.68–0.81). The intraobserver κ for the 2 sequential readings of the angiographic results was also substantial at 0.76 (95% CI, 0.72–0.81), ranging from 0.58 to 0.85. The ANOVA intraclass correlation among readers was 0.86 (95% CI, 0.81–0.90) for the first reading and 0.82 (95% CI, 0.76–0.87) for the second reading. The overall intraclass correlation score for both readings was 0.84 (95% CI, 0.79–0.88). Inter- and intraobserver agreement is presented in On-line Tables 1 and 2. Variation of the aneurysm occlusion status between posttreatment and follow-up DSA showed 73.3% (n = 469/640) improvement, 16.6% (n = 106) stable occlusion, and 10.1% (n = 65) increase of opacification of the aneurysms compared with posttreatment DSA. The intra- and interreader κ was 0.73 (95% CI, 0.70–0.77) and 0.78 (95% CI, 0.71–0.84), respectively. These data are summarized in Table 1. We dichotomized follow-up DSA results as complete versus incomplete occlusion. The interobserver κ at follow-up was 0.63 (95% CI, 0.56–0.70), ranging from 0.42 to 0.76; the intraobserver κ was 0.71 (95% CI, 0.55–0.88), ranging from 0.47 to 0.85. To compare with histologic findings, a fifth reader was needed in 31.2% cases (25/80) to adjudicate between complete or incomplete occlusion. The adjudicated dichotomized DSA evaluation yielded 40% (32/80) complete occlusion and 60% (48/80) incomplete occlusion. We dichotomized DSA results as adequate occlusion (complete healing or proximal recess persistence) versus inadequate occlusion (neck or aneurysm remnants). The interobserver κ at follow-up was 0.69 (95% CI, 0.64–0.73), ranging from 0.50 to 0.79; the intraobserver κ was 0.75 (95% CI, 0.62–0.89), ranging from 0.55 to 0.85. To compare the DSA results with histologic findings, we determined a consensus value to allocate in the adequate versus inadequate occlusion group, according to the most present value without need for a fifth reader to adjudicate. The consensus dichotomized DSA evaluation yielded 68.8% (55/80) adequate occlusion and 31.2% (25/80) inadequate occlusion. Histologic evaluation at the time of follow-up DSA depicted 18.8% complete healing (n = 15/80 aneurysms) and 21.2% (n = 17) proximal recess persistence; 13.8% of cases (n = 11) had aneurysm neck remnants, and 46.2% (n = 37) had aneurysm remnants. We observed, respectively, 40% (32/80) complete occlusions, 60% (48/80) incomplete occlusions, 53.8% (43/80) adequate, and 46.2% (37/80) inadequate occlusions. Illustrative correlations between follow-up DSA and histology are presented in Figs 1 and 2. Complete aneurysm occlusion. Angiographic-histologic correlation. Pretreatment DSA shows an aneurysm on the right subclavian artery at the origin of the right common carotid artery (A). Follow-up DSA shows complete occlusion of the aneurysm (B). An all-mount histologic sample shows complete occlusion of the aneurysm, filled with conjunctive tissue and with any lack of organized tissue in to the aneurysm cavity or at the level of the neck (C). Photomicrograph (hematoxylin-eosin, original magnification ×100) shows complete coverage of the neck with endothelial tissue with complete healing (D) and organized connective tissue within the aneurysm lumen. Aneurysm remnant. Angiographic-histologic correlation. Pretreatment DSA shows an aneurysm on the right subclavian artery at the origin of the right common carotid artery (A). Follow-up DSA shows partial filling of the aneurysm sac (blue arrow, B). An all-mount histologic sample shows a lack of filling of the aneurysm by the conjunctive tissue (blue arrow, C). Photomicrograph (hematoxylin-eosin, original magnification ×100) shows a lack of coverage of the neck by endothelial tissue and filling of the aneurysm pouch with a partial thrombosis in the aneurysm sac (D). We observed 24 (30%) cases for which DSA and histologic evaluations agreed for complete occlusion (complete occlusion with or without recess filling) and 40 (50%) cases for which DSA and histology agreed for incomplete occlusion. In 8 (10%) cases, DSA suggested a complete occlusion but histology identified incomplete, and similarly, 8 (10%) cases that had been misassessed as incomplete by DSA were found to have complete occlusion on histology (Table 2). Sensitivity and specificity of the DSA for the diagnosis of complete versus incomplete occlusion at follow-up compared with the histologic results as the reference standard were respectively 75% (95% CI, 56%–88%) and 83.3% (95% CI, 69%–92%). The overall accuracy of the DSA evaluation compared with the reference standard histology was 80% (95% CI, 65%–90%). We observed 42 (52.5%) cases for which DSA and histologic evaluations agreed for adequate occlusion (complete occlusion or neck remnant) and 24 (30%) cases for which DSA and histology agreed for inadequate occlusion. In 13 (16.2%) cases, DSA suggested an adequate occlusion but histology identified inadequate occlusion, and similarly 1 (1.3%) case was misassessed as inadequate by DSA but was found to have adequate occlusion on histology (Table 3). Sensitivity and specificity of the DSA for the diagnosis of adequate versus inadequate occlusion at follow-up compared with the histologic results as the reference standard were respectively 97.7% (95% CI, 86.2%–99.9%) and 64.9% (95% CI, 47.4%–79.3%). The overall accuracy of the DSA evaluation compared with the reference standard histology was 82.5% (95% CI, 73.8%–91.9%). Using a histologic reference standard, our study performed on a large series of experimental aneurysms demonstrates that the angiographic WOS is sensitive, specific, and accurate in assessing aneurysm occlusion following treatment of intracranial aneurysms with the WEB device. In addition, we found a substantial level of inter- and intraobserver agreement for the WEB Occlusion Scale. These findings suggest that the WEB Occlusion Scale is an easily reproducible and accurate tool in assessing aneurysm occlusion following treatment with the WEB device. Our current results are in accordance with the clinical study published by Fiorella et al,7 which reported a κ value statistic at 0.779 (95% CI, 0.70–0.86). 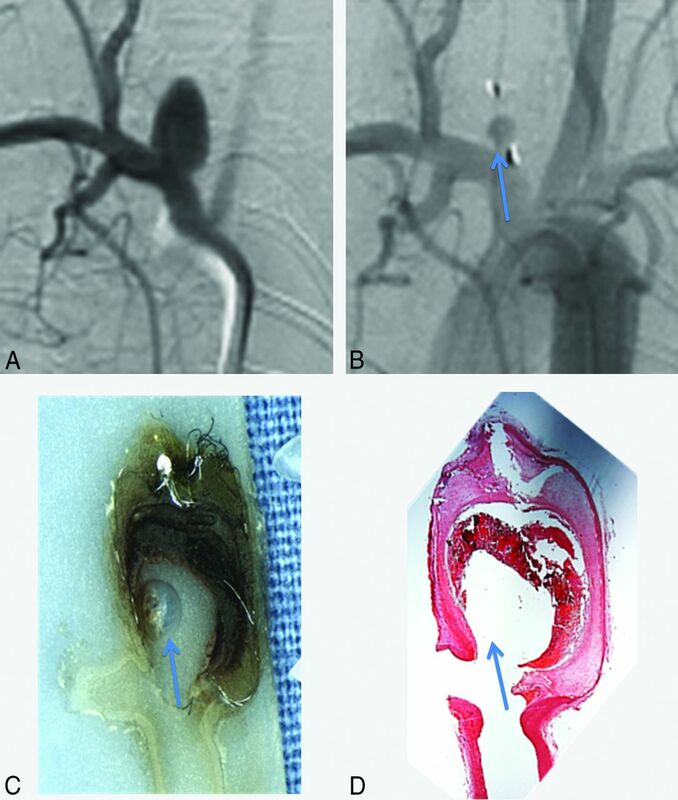 Our study is the first to compare angiographic assessment of aneurysm occlusion after treatment with the intrasaccular WEB device with histologic controls. Assessment of occlusion is challenging following treatment with the WEB because the angiographic appearance differs from that of coiled or intraluminal flow-diverter-treated aneurysms.7 The proximal surface of the WEB is slightly recessed into the body of the device, thus forming a concave “marker recess” at the parent artery–aneurysm interface, to avoid any protrusion of the device in the parent artery. This marker recess opacification can be mistaken for residual filling of the aneurysm neck. Our study is limited by its retrospective nature and the use of only selected images for the DSA readers' assessment. Readers did not have access to the complete angiographic run when assessing angiographic occlusion. Furthermore, only 1 experienced reader evaluated the histologic samples. However, this reader was blinded to the DSA outcomes. Another limitation of this study is that rabbits were sacrificed at different time points, which can modify the outcomes after WEB implantation, depending on the length of follow-up. This study confirms the consistency and reliability of the WEB Occlusion Scale for DSA evaluation of WEB-treated aneurysms with substantial interobserver and intraobserver agreement. Furthermore, the WEB Occlusion Scale appears to be accurate compared with a histologic reference standard, which is of great importance to justify its use in clinical studies for the evaluation of the WEB device. We thank Ravi Lingineni, BST, from the Department of Health Sciences Research of Mayo Clinic, for his contribution to statistical analysis. Disclosures: Waleed Brinjikji—UNRELATED: Grants/Grants Pending: Brain Aneurysm Foundation. * David F. Kallmes—RELATED: Grant: Sequent Medical,* Comments: preclinical research studies; UNRELATED: Board Membership: GE Healthcare (Cost- Effectiveness Board membership); Consultancy: ev3/Covidien/Medtronic,* Comments: planning and implementing clinical trials, Steering Committee membership; Grants/Grants Pending: MicroVention,* Codman,* Surmodics,* NeuroSigma,* ev3/Covidien/Medtronic,* Comments: preclinical research and clinical trials; Royalties: University of Virginia Patent Foundation, Comments: Spinal Fusion; Travel/Accommodations/Meeting Expenses Unrelated to Activities Listed: ev3/Covidien/Medtronic,* Comments: FDA panel presentation, open comments section. Ramanathan Kadirvel—UNRELATED: Grants/Grants Pending: National Institutes of Health. * *Money paid to the Institution. Accepted after revision July 14, 2015.